From the very beginning political establishment and media put pressure on the migrants’ hunger strike accusing their struggle as an illegal act; legitimizing in this way the violation of the academic asylum and the forced evacuation of the building. In the afternoon of Thursday 30 of January, police interrupts traffic in central Athens, creating an image of an occupied city, and encircles the building of the Law school. Thousands of people that came in solidarity are obstructed from accessing the area which is surrounded by the police and spontaneously set up gatherings in protest. From 6 o clock in the afternoon until 5 in the morning, hunger strikers are being blackmailed to leave the building. In the middle of this very long night, the hunger strikers along with the people in solidarity finally move to another central Athens building in a 4 a.m. demonstration! This place (privately owned), however, turned out to be something similar to a refugee camp, as it has not enough space and hygienic infrastructure and many of the hunger strikers are obliged to sleep in tents in the frozen courtyard. Government and media totally depreciate this migrants’ struggle, which is pictured as motivated by promoters so as to create ‘social unrest in the country’. It is one of the hunger strikers, though, that gives the answer: “the most frustrating of all is that they cannot understand that the neediness that brought us here is so great that we do not need promoters but supporters”. In a climate of intimidation and repression 5 companions from the Solidarity Assembly are been called by the state advocate as suspects for the crime of “trafficking”. At the same time the minister of interior denied any possibility of legalization and repealed the decree under which 15 migrants, hunger strikers were legalized back in 2009. In addition to that he called all migrants’ communities in Greece to comply so as “to prevent their members from participating on events that would act as hot spots”. We, people in solidarity to the fair struggle of the migrants hunger strikers, declare our joint responsibility together with the 5 companions and we also declare being “traffickers” of dignity and solidarity. In a climate of repression and anti-migrant policies in Greece and all over Europe, we need to act in order to create symbolic cracks in the system and achieve political victories. It is more urgent than ever to vow the broadest support to the fight of the 300 hunger strikers. We call for a common day of action on the 11th of February, a day where actions of solidarity will take place in all over Greece. We address our appeal to every association, union, organization and political group and everyone to protest in solidarity to the migrants’ fair struggle. In solidarity with the 300 migrants, workers, hunger strikers. Yesterday, January 25, three hundred (300) migrants who work in Greece without papers or any civil rights began what is perhaps the largest hunger strike in Greek history. The struggle of these migrants highlight the general crisis of migrants and refugees across Greece and Europe. “I want papers to be able to go to hospital, to be treated as a human being,” explained a 29-year old Moroccan. “I’m fed up with this life without papers.” He has been working “menial” jobs on the Island of Crete for 5 years. With no other way to make their voices heard or demand their rights 250 migrants have occupied an unused building in the Law School of Athens where Police are forbidden by the University Asylum law to enter university grounds. Another building, the 7th floor of the Labor Center of Thessaloniki, has also been occupied by 50 others. Even during times of “business as usual”—when elite profit, power, and privilege is not in jeopardy, but the everyday lives of everyone else are—migrants are easy targets for blame and exploitation. However, as material conditions worsen in Greece due to the current financial crisis, so have the lives of migrants worsened—becoming more precarious. The statement of the Assembly of Migrant Hunger Strikers explains that the lives of migrants have become even more unbearable as workers “salaries and pensions are cut and prices rise.” Migrants have become targets more often and their lives more vulnerable. Under these conditions faced by the striking migrants, it is imperative not to remain silent, and to lend support for the demands of the migrants. 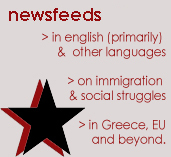 Intellectuals of Greece, Europe, and elsewhere must express their solidarity by lending support for the demands of the migrants and participating in their struggle and defense. Public expressions of solidarity and support are urgently needed as the deadline for striking migrants to leave the Law School of Athens’ is currently under consideration. 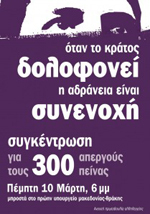 We, the authors, wish to express our solidarity with the 300 migrant workers on hunger strike in Greece. Their struggle is an important part of the struggle for migrant justice and human rights all over the world. Declaration of solidarity with the hunger strikers – Call for a week of action! But we are talking about human beings, with dreams and hopes, with plenty of reasons to go and to move. But as they arrive in Europe, they find themselves deprived of their rights as human beings, at the mercy of an asylum system, and at the fringes of society. It is exactly this social exclusion and disfranchisement, it is the lack of political and social rights that leads to the often unbearable conditions that are then denounced as the “migration problem”, used to justify repression, further exclusion, and deportation. Migration is neither a crime nor a problem, but the European Union’s response is criminal and highly problematic. The 2008 European Pact on Immigration and Asylum has cemented this inhuman policy pursued for many years. While mentioning necessary advances in asylum and legal migration legislation, it has foremost served as a political initiative to harden the borders, further exclusion and deportation and is a declaration of war on migration. It lengthily talks about the solidarity between the EU member states, but it robbed especially the southern states of the only sensible answer to migration: it contains an explicit ban on collective legalisation. We will bring these common demands from Bamako during our two weeks-tour through Westafrica and afterwards to the World Social Forum in Dakar. 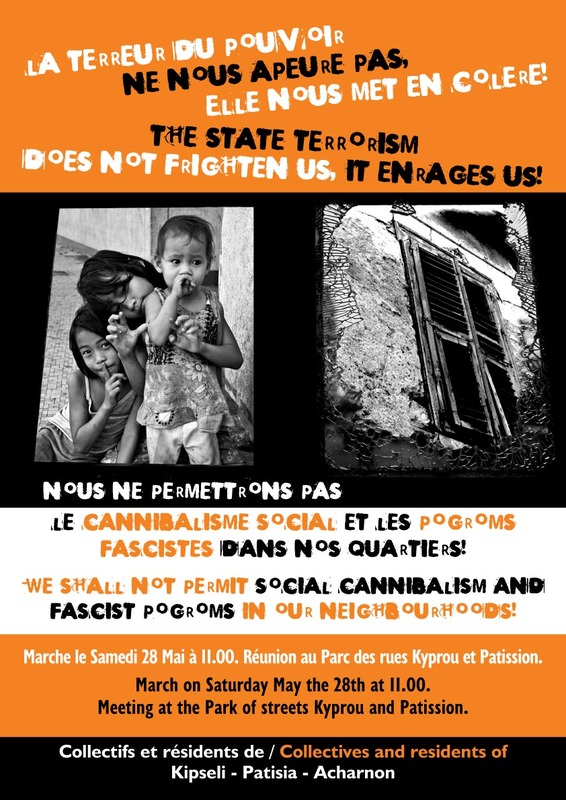 And we will – if necessary – promote your struggle in Dakar again and call for more transnational solidarity. Join us in supporting the cause of Afghanian Refugees in Greece by signing this petition and spreading the information. We demand that the Greek government and UN high commissioner accede to the demands of Afghanian refugees in Greece to prevent a great humanitarian disaster. All we refugees from Afghanistan came to Europe because we couldn’t live any more in refugee camps in our country. We can’t live any more in villages that are bombed by NATO airplanes or are ravaged by the army and its tanks. We can’t live us and our families not only because there is no freedom or democracy, but also because the economy is non existent. We can’t live in the neighboring countries like Pakistan as war has reached it also destructive floodings that had made a new wave of poverty, hunger and refugees. We were chased in Iran, in Turkey and in many other countries. We don’t want anyone to take advantage of our right to live and stay away from the various battlefields. No more people drowned on Aegean sea or in Evros river. Neither to be sent back by the European countries in the name of the Dublin 2 treaty, to be again on the run and homeless facing the police, fascists and racists. We want peace, which is more valuable and all the people around the world want it. Lets make the countries stop their wars and bring back the occupation armies and give the money they spend for education or for health. 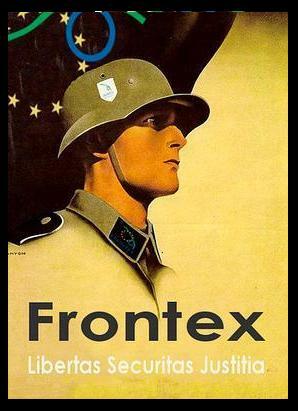 We have the right for political asylum for all the refugees and the Greek government must give it to us. We call the Greek citizens to support our struggle. COMMITTEE OF AFGHAN REFUGEES FOR POLITICAL ASYLUM.